CDS Manufacturing has received an order to sort 200,000 sleeves. Using automatic vision inspection equipment currently on our floor, these parts will be sorted for chips in the ID, hole presence, and mixed parts. We have sorted millions of parts without failure on this equipment. CDS Manufacturing recently completed another precision roll sorter. This system equipped with a bulk dumper, ball feeder, and precision roll sorter assembly with a pair of .000005″ TIR rollers was recently built to sort bearing balls. This system can sort balls at over 24,000 parts per hour into 10 different size categories. This system has proven to be a popular choice among bearing and ball manufacturers. Check out our roll sorter page for more info. CDS Manufacturing offers inspection and sorting services using a wide array of automatic equipment currently on our production floor. In addition to laser length sorting equipment, laser diameter sorting equipment, and precision roll sorters, we also have high speed vision inspection machinery available for sorting our customers product. Our customers prefer our automatic vision inspection service because it is faster and much more efficient than manual processing by an operator. We have sorted millions of brass inserts for chips in the ID, missing threads, missing countersink, mixed parts, and more with our vision inspection equipment. We would be happy to discuss your application. Call us today for a free analysis and quotation for our automatic vision inspection services. A piece of equipment that is gaining popularity is our automatic o-ring installation machinery. These systems are available in modular, semiautomatic, and fully automatic configurations. Our fully automatic systems include vibratory feeders for the o-ring and the receiving part, indexing part nests for synchronous operation, pick and place equipment with custom end tooling for part transfer and o-ring installation, vision inspection equipment to confirm o-ring installation, and good / reject part gating systems to deliver parts to their respective outputs. A system recently designed and built by CDS Manufacturing is shown below. Contact us today for a free expert analysis of your requirement. CDS Manufacturing provides in house sorting and inspection services. Current equipment on our floor includes diameter inspection machines, length inspection machines, high speed vision systems, precision roll sorters, and more. In the last two months we have sorted over 5,000,000 pins, roller bearings, sleeves, medical components, lightbulb filaments, plastic parts, nuts, and brass inserts using automatic inspection and sorting equipment on our production floor. CLICK HERE or more information on our sorting and inspection services. CDS Manufacturing has just completed a precision roll sorting system equipped with an automatic ball feeder, a precision roll sorter equipped with a pair of .000005″ TIR rollers.. (YES! That’s FIVE MILLIONTHS of an inch), adjustable height and angle stanchion, roller position adjustments, roller position locks, adjustable fallout baffles, and seven stainless steel strorage bins all mounted on a portable pedestal base. The operator sets up the precision roll sorter for the desired fallout and then loads parts into the ball bearing feeder. 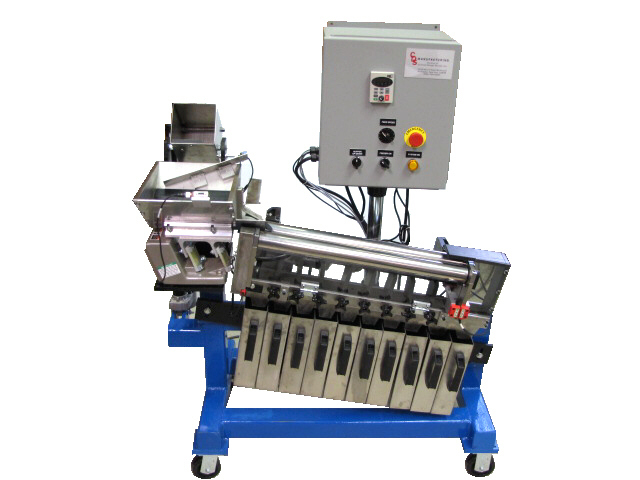 The ball bearing feeder feeds ball bearings to the precision roll sorter. The roller bearings travel down the roll sorter and fall through the rollers at their predetermined locations. Sorted parts are stored in the stainless steel containers below. CDS Manufacturing has received a service contract to provide automatic vision inspection services at our Rochester NY facility. 1 Million brass inserts per month are automatically inspected using vision inspection equipment on our production floor. Brass inserts are inspected for missing countersink, thread presence, and chips in the inner diameter. This service has prevented hundreds of defects from reaching our customer’s automotive client and resulted in a significant cost savings by avoiding containment. The automatic vision inspection services provided by CDS Manufacturing have effectively added money to our customer’s bottom line. 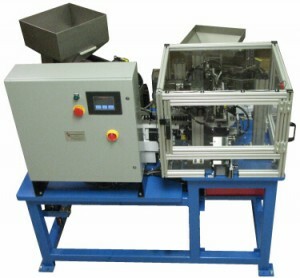 CDS Manufacturing has completed a custom designed and built automatic o-ring installation machine. This system automatically feeds and orients draincocks to a pick up nest where a pick and place loads it onto an indexing dial plate. The dial indexes presenting the draincock at the o-ring installation station. An o-ring is removed from the pick up nest and installed onto the draincock. The dial indexes presenting the assembly in front of a vision system. The vision system confirms that an o-ring has been installed onto the draincock. The dial indexes presenting the assembly at the unload station. An automatic good / reject part gating system diverts parts to their respective output chutes. Good parts exit the system via the good parts output chute. Reject parts are diverted to the reject parts output chute and are stored in rejects container below. This system automatically installs o-rings at a rate of approximately 30 parts per minute. Please CLICK HERE to view a system video. CDS MANUFACTURING RECEIVES AN ORDER FOR A TUBE BENDING FIXTURE. CDS Manufacturing has been awarded a purchase order Bernzomatic to provide a Tube Bending Fixture. This system will bend burner tubes in two different configurations using adjustable and changeover tooling. The operator loads tubes into the fixture and presses a pair of electronic finger buttons to start the cycle. The hydraulic cylinder advances pressing the tube against the form tooling to create the desired tube bend. The operator removes the completed part from the fixture. CDS MANUFACTURING RECEIVES AN ORDER FOR A TABLE TOP ROLL SORTER. CDS Manufacturing has been awarded a purchase order from Vishay Dale Electronics to provide a precision table top roll sorter. This system will include a pair of 12″ case hardened stainless steel rollers with a roller accuracy of +/- .0002″, roller position adjustments, roller position locks, adjustable fallout baffles, and five stainless steel storage bins. the safety enclosure and removes the completed part. CDS MANUFACTURING RECEIVES AUTOMATIC LENGTH SORTING CONTRACT FOR ANOTHER 150,000 WIRES. CDS Manufacturing has been awarded an ongoing contract to automatically inspect approximately 150,000 medical wires per month for overall length. These parts will be sorted using automatic length inspection machines currently on our production floor. The system, equipped with an LED length inspection station, will automatically inspect .015″ diameter wires for a length of .140″ +/- .002″. CDS MANUFACTURING AWARDED CONTRACT FOR VISION INSPECTION OF ONE MILLION RUBBER BUMPERS. CDS MANUFACTURING AWARDED PACKAGING CONTRACT FOR 10,000 TOILETRY KITS. CDS Manufacturing has been awarded a contract to collate and package 10,000 toiletry kits. Our production staff will install various soaps, shampoos, lotions, and the like into a labeled zipper bags. Completed kits will be packed out to a specific quantity in an overpack container and stacked on a pallet in the required matrix. The completed pallets of product will be wrapped, strapped and labeled for drop shipping to our customer’s specified location. CDS MANUFACTURING AWARDED CONTRACT TO AUTOMATICALLY SORT TUNGSTEN PINS BY DIAMETER. CDS MANUFACTURING AWARDED CONTRACT SEMIAUTOMATIC O-RING & RETAINER RING INSTALLATION SYSTEM. CDS Manufacturing has been awarded a contract to design and build a semiautomatic o-ring and retainer ring installation system. This system will include support and clamping for the radiator tank that the rings are installed onto, staging nests for both rings, part present sensing of all of the components, o-ring / retainer ring vacuum transfer, and vision based inspection of the completed assembly. Acceptable assemblies will be marked with a prick punch. CDS MANUFACTURING AWARDED CONTRACT FOR SECOND SEMIAUTOMATIC WIRE DIAMETER INSPECTION SYSTEM. CDS Manufacturing has been awarded a contract to build a second semiautomatic wire diameter inspection machine. The operator loads “feedback wires” into the measurement fixture as each is fabricated. The measurement system then moves the wire through an LED / camera measurement head, measuring at several points along the length of the wires. The system records diameters, position, and length. Linear regression is used to characterize the tapered feature of the wires. and dimensional accuracy of each wire. This information is then displayed and logged for each individual wire. The operator uses the information to adjust the fabrication operation of the next wire. CDS MANUFACTURING COMPLETES SEMIAUTOMATIC GUIDE ASSEMBLY FIXTURE. CDS Manufacturing has completed the design and build of an automatic guide assembly fixture. This two sided fixture allows one or two operators to assemble product. This operator loaded system confirms the presence of four different components in the assembly fixture. The operator presses a pair of palm buttons and the components are automatically installed. Part present sensors confirm proper installation of the components. An operator interface displays the status of the assembly and alerts the operator to any issues with the assembly. CDS MANUFACTURING RECEIVES AUTOMATIC LENGTH SORTING CONTRACT. CDS Manufacturing has been awarded a contract to automatically inspect medical wires for overall length. These parts will be sorted on one of our automatic length inspection machines currently on our production floor. The system, equipped with an LED length inspection station, will automatically inspect .015″ diameter wires for a length of .140″ +/- .002″. CDS MANUFACTURING AWARDED AUTOMATIC DIAMETER INSPECTION SERVICES CONTRACT. CDS Manufacturing has been awarded an automatic inspection service contract to inspect tungsten wire diameter. Parts will be sorted using one of the automatic LED diameter inspection systems currently on our production floor. Typically, parts are loaded into a vibratory feeder and fed past LED inspection equipment that measures the diameter of the parts. Good and reject product are separated by an automatic gating system. Good parts will be packed out in like quantities in the customer’s packaging. Reject parts will be returned in separate packaging clearly labelled as “Rejects”. CDS MANUFACTURING COMPLETES SEMIAUTOMATIC WIRE DIAMETER INSPECTION SYSTEM. CDS Manufacturing designed and built this semiautomatic wire diameter inspection machine. The recorded and calculated measurements are used to characterize the natural frequency, and dimensional accuracy of each wire. This information is then displayed and logged for each individual wire. The operator uses the information to adjust the fabrication operation of the next wire. CDS MANUFACTURING COMPLETES SEMIAUTOMATIC VISION INSPECTION SYSTEM. CDS Manufacturing designed and built this operator loaded vision inspection machine. This system verifies that the operator has assembled the chain glide face to the chain guide arm properly. The visiion system looks at both ends of the brackets as they slide through the inspection camera’s field of view. The vision system verifies that both locking features, one at either end, are fully engaged. If they are, a discrete punch mark is applied to each assembly. The inspected parts are automatically ejected from the system into either a good or reject output chute. Each part is inspected in about 7 seconds. CDS MANUFACTURING COMPLETES SEMIAUTOMATIC ASSEMBLY SYSTEM. CDS Manufacturing designed and built this semi-automatic assembly system. This system allows two assemblies to be processed at the same time by one or two operators. The operator(s) load one insert and one bracket on to each nest and then begin the machine cycle with the corresponding touch buttons. Part present sensors confirm that the components are all present and thenthe parts are automatically assembled. A discrete punch mark is applied to each assembly for traceability. Completed assemblies exit the system to the rear of the machine. 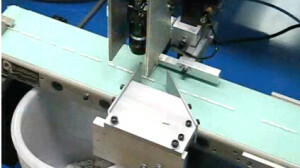 CDS MANUFACTURING COMPLETES KNIFE HANDLE FEEDER SYSTEM EQUIPPED WITH VISION INSPECTION EQUIPMENT. CDS Manufacturing designed and built this automatic knife handle feeder system. This system utilizes vision inspection equipment and a rotator to orient the handles for blade insertion. A dual headed pick and place positions a pair of handles at the end of the system where the blades are inserted. Part present sensors verify that all of the components are properly positioned and a heating elament assembles the blades to the handles. CDS MANUFACTURING COMPLETES A STEP FEEDER SYSTEM EQUIPPED WITH VISION INSPECTION EQUIPMENT. The system shown here includes a step feeder, output conveyor, vision system, good / reject gating, and process controls for four different parts. Parts in the wrong orientation are diverted back into the step feeder. Mixed parts are gated as rejects, and good parts are fed off the end of the output conveyor. This system feeds parts at a rate of up to 80 parts per minute. CDS Manufacturing’s Step Feeders offer low maintenance vibration free parts feeding with the ability to feed a wide variety of parts. In a word….. Simple Reliability. CDS MANUFACTURING COMPLETES ANOTHER O-RING INSTALLATION MACHINE. A video of an o-ring installation system is available online, click here…. The system shown in the video includes an infeed conveyor, o-ring magazine and presentation tooling, an o-ring expander, a dual headed pick and place system, o-ring assembly inspection equipment, a touch screen operator interface, good / reject part gating, and process controls. This system installs o-rings at a rate of 20 parts per minute. Plastic parts are received directly from the mold to the infeed conveyor. Orientation tooling maintains the orientation of the plastic part as it is fed towards the assembly area. Hold & release tooling delivers one part at time to the assembly nest. The assembly nest automatically orients the part radially. O-rings are dispensed from a magazine for removal by the pick and place. The three headed pick & place unit delivers an o-ring to the expander, installs an o-ring, and removes the prior assembly simultaenously. Completed assemblies are inspected for proper o-ring installation. Good & reject parts are gated accordingly and exit the system via their respective output chutes. Automatic and semiautomatic o-ring installation machines are available for a variety of assembly operations. O-ring assembly systems are available with individual parts feeders, magazine fed o-rings, assembly inspection equipment, and more. Contact with your o-ring assembly application for a free quotation. Contract Design Service, Inc. has acquired product line assets of Lipe Automation in Liverpool, NY including the Dyna-Slide and Dyna-Belt brand names, and additional parts feeding, conveyor, and material handling products. CEO and owner Frank W. Scarson says the newly formed company, “CDS LIPE” designs and builds a full range of material handling equipment. The company employs 15 people in Liverpool, NY. Contract Design Service, Inc. is also the parent company of CDS Manufacturing in Rochester, NY. CDS Manufacturing designs and builds automation equipment, inspection and sorting systems, vibratory feeders and step feeders, and provides inspection, sorting, packaging, and assembly services. Increased business volumes and planned acquisitions are adding to the corporations future growth. Please feel free to contact us for a free consultation regarding your application at either our Rochester, NY or Liverpool, NY locations. Division of Contract Design Service, Inc.
CDS Manufacturing completed an automatic system that inspects worm gear shafts for journal diameter and inspects for the presence of chips wrapped around both ends. Parts we fed from a vibratory bowl feeder to a gravity track with the parts oriented end to end with the short end leading. A hold and release mechanism allowed one part at a time into an inspection nest where an LED inspection system measured the journal diameter. Upon completion of the journal diameter inspection, a vision system, with the aid of back lighting, inspected the part for chips wrapped around either end of the part. A good / reject part gating system was provided to separate the parts. Parts found to have a journal diameter that did not fall within the specified limits were gated as rejects. Parts that passed the LED and vision inspection were gated as good parts and exited the system via the output chute provided. CDS Manufacturing completed an order for a 5 up spheroid sorter. The system automatically inspects spherical product for flats, doubles, clusters, and debris. Parts are fed from a common hopper to a vibratory surface that separates the spheres according to their individual quality. Parts are sorted at an estimated rate of over 200,000 parts per minute. Sorted parts are stored in common storage bins. CDS Manufacturing received an order for a Precision Roll Sorter equipped with 50 millionths TIR rollers. System included a bulk hopper, linear vibratory feeder system, orientation station, output track, precision rollers, roller adjustments and locks, adjustable baffles, roller speed controls, and stainless steel storage bins. The entire system was mounted on a heavy duty machine base. System will be used for sorting of screw machine parts for length, width, diameter, and foreign materials. CDS Manufacturing received an order from a screw machine parts manufacturer for inspection services to inspect a wide variety of screw machine parts. Inspection services include oversized inner diameter inspection, missing thread inspection, inspection for chips and foreign materials, length inspection, and outside diameter inspection. Automatic inspection services are provided by modifying in house inspection equipment to perform various inspection tasks such including laser inspection services, vision inspection services, eddy current inspection services, LED inspection services, roll sorting services, and custom automated inspection services. CDS Manufacturing also provides manual inspection services. CDS Manufacturing has completed building a machine to inspect automotive Fuel Pressure Connector Bodies. The fully automatic system uses a vibratory bowl feeder and Eddy Current technology to sort out defects including cracked parts, undersized threads, missing threads, deformed features, long parts, short parts, bar ends, material defects, chamfer deviations, and soft parts. Good parts are fed via a cleated conveyor to an automatic tote handling unit for packout. CDS Manufacturing has completed the design and build of a Radiator Inlet and Outlet Tank Assembly System. The automatic assembly system automatically installs a petcock, installs clamp nuts, confirms o-ring presence, and spin-welds a closure plug in place. The system included error proof fixturing (poke-yoke) and included part present sensors and tooling to confirm proper assembly. CDS Manufacturing received an order to length sort pistons for parts with an undersized length. A roll sorter, currently on our production floor, was modified and equipped with a laser and gating system to sort the parts for undersized length. CDS Manufacturing recieved an 80,000 piece kit building order for packaging of automotive components. Six accessories are packaged in a heat sealed bag. The automotive component is wrapped with bubble wrap and inserted into a box with the heat sealed bag of accessories. Box labels and pallet labels are applied. To date, and for the past 23 years, CDS Manufacturing maintains a zero defects record with this customer. CDS Manufacturing received an order to inspect automotive manifolds. Twenty five different features are inspected on each part, including visual inspection for flash, damage and missing components, as well as gauging, fit and functional testing. CDS Manufacturing received an order to inspect valve assemblies. The application called for us to sort for oversized diameter of a hole in the valve, and the visual inspection of the assembly to confirm the presence of two O-rings. CDS Manufacturing received a containment order to inspect automotive electrical connectors for poorly assembled components. The nationally known electronics company was referred to us by the end user who happens to be one of our long time automotive equipment customers. The containment was completed within four hours. CDS Manufacturing received an order for contract sorting of a family of dowel pins. The requirement was two fold. Inspect dowel pins for a specified diameter with a tolerance of +/- 0.00025”, and sort for length to a tolerance of +/- 0.005. To accomplish the diameter sort, we utilized an existing Roll Sorter (also known as a roller sorter) on our production floor. Our precision Roll Sorters are capable of sorting to within 0.000050”. That’s 50 MILLIONTHS of an inch! For the length sorting requirement we utilized a vibratory parts feeder and linear vector displacement transducer (LVDT) currently on our production floor. The parts are automatically fed to the LVDT measurement tooling where we sort for length. Good parts and reject parts are sorted into separate storage bins by an automatic gating system. CDS Manufacturing received an order for contract inspection and sorting of two similar parts that were mixed at the plating process. The parts differ in length by less than .001″. To accomplish this task, we modified an existing laser sorting system on our production floor. The system utilizes a vibratory parts feeder to feed, orient, and present the parts to the laser measurement tooling. The automatic system sorts mixed parts at a rate of 2,500 parts per hour.